The Scottish Women's Rural Institutes Cookery Book (Eighth Edition). For those of you who don't know, the S.W.R.I or the Rural, as it is commonly known, is a sort of equivalent of the Women's Institute in England. It started in 1917 to provide social, educational and recreational opportunities for those who live and work in the country or are interesed in country life. Food and Crafts feature heavily in their 'manifesto'. This book belongs to my MIL, but when I moved to the farm I joined the Rural and continued as a member until I went back to work full time. It was a great way of meeting people and making friends. As I'm on holiday at home this week, I decided this would make a nice lunch for me today. 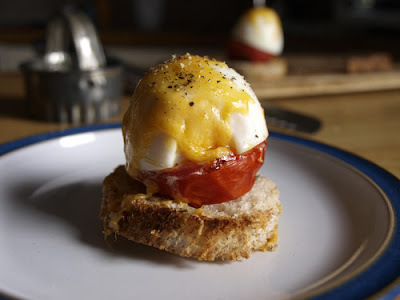 There are a couple of things to note about this recipe, if you want your Acorn Eggs to look like acorns you really have to have a LARGE tomato and a SMALL egg, not the other way around!!!! I cut my slice of bread into rounds with a pastry cutter, but you don't have to, it just looked prettier. The other thing is that the cheese doesn't stay on the egg very well. I do wonder if it might be better to toast the cheese on the bread, then put on the tomato and egg with a little sprinkling of cheese just to cover the top of the egg. Here it is, the finished Acorn Egg, see what I mean about the tomato/egg ratio? There are, of course two, the other one is lurking at the back of the picture, but when I put them both on the plate to take a photo, they looked a bit like a well endowed lady sunbathing - hee hee hee! 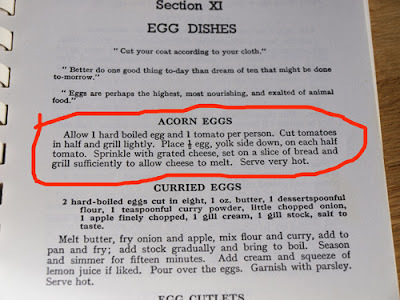 It tasted fine, like egg and tomato on toast with a bit of melted cheese on it, I'm not sure I could be bothered faffing about making it look like an acorn again though! Allow 1 hardboiled egg and 1 tomato per person. Cut tomatoes in half and grill lightly. Place 1/2 egg, yok side down, on each half tomoato. Sprinkle with grated cheese, set on a slice of bread and grill sufficiently to allow cheese to melt. Serve very hot. Looks interesting. Maybe the cheese would stick better if the egg was hot? Anyway I like making it all look like an acorn. Janice - your post did make me smile! 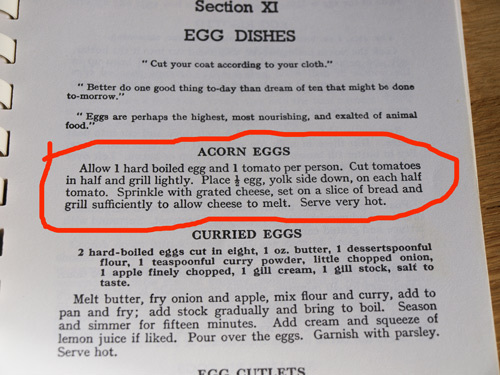 I've never heard of Acorn Eggs - is it supposed to be a Scottish dish? Mince and Skirlie - you could be right about the hot egg. Not sure how you would keep the yolk in if you had the egg soft boiled and still make it look like an acorn! Jac - I've never heard of it either, don't think it is particularly Scottish. It was fun to make though. hehe... you always bring a smile to my face. I like eggs (scrambled, poached and occasionally fried). Happy you got a good random recipe. They did turn out cute! These seem very sixties, but good fun for all that. And they do look quite a lot like acorns. What a great name for this dish- I can really see where the 'Acorn' in the title comes from! I'm sure it made a tasty lunch. Wonderfully random. This was the sort of thing that I thought was pure sophistication back in the early 70s. 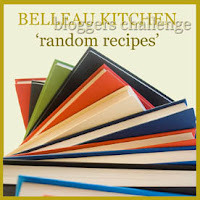 What a bizarre recipe - I am sure you must be in the running for most random recipe! Would make a nice breakfast. Your ratio warning made me chuckle! 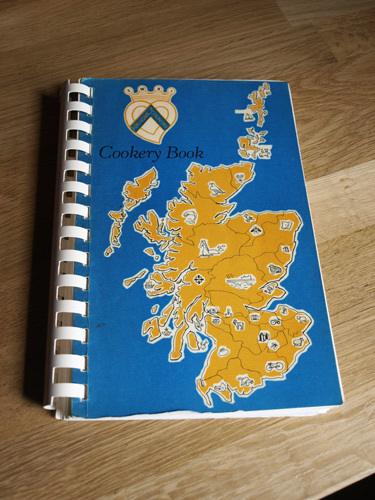 Oooh I love books like that, with old traditional recipes in it (not tripe though *boak!*). I now want to run away to a farm and join the S.W.R.I... sigh! Found your blog through LinkedIn. Phew what a challenge!! This is a new dish for me. Yours looked too good to eat. What a GREAT book and recipe......I love books/booklets like that, they always have unusual recipes in them. Janice, this is fabulous - I'm sitting here laughing at the thought of you realising how both acorn eggs looked through the viewfinder of your camera! Lovely post, as always. 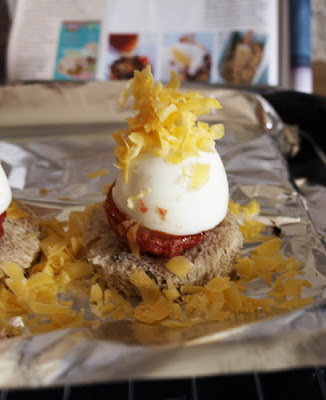 Wow, that's quite an unusual recipe, what a cute twist on the sandwich :-) I am going to have to make this now, as my li'l girl won't eat eggs unless they are prettied up somehow. Thanks for this!